Are you sick of the same iceberg or romaine lettuces? Do you crave – as I do – warm and comforting foods in winter, even if you still want to pay attention to your shape? Well, as soon as winter comes, I feel myself start craving carbs, warm foods, and rich, fattening dishes. The idea of preparing myself a fresh (and cold) salad (even if I definitely love it in the warmer season), just gives me shiver! Fortunately, I found some dishes which give me the satisfaction that rich foods usually offer in winter, but with less calories and fat… and keep me warm as well. One of these is this super easy “winter salad”, which mixes warm and cold food, in a fusion of flavor and tastes that I love! I know that Belgian Endive is not a very popular kind of vegetable, but it is very healthy and good for you, so why not to give it a try? I promise: you wont regret it! First of all, peel the potatoes and cut them in about 1.5 x 1.5 inches cubes (if you want them to cook faster, just cut them in smaller cubes, but with the risk that they fall apart). To boil the potatoes I usually put them on a pot with just half an inch of water, cover with the lid, and let them boiled for about 15-20 minutes. In the meantime, wash your Belgian Endive under water, dry it very well, cut it first in two sections and take off the white root, and then cut it in pieces. As soon as the potatoes are boiled, dry them very well, put them in a bowl with the Belgian Endive, and dress with about 2 tsp of olive oil, 1 tbs wine vinegar, salt and pepper. 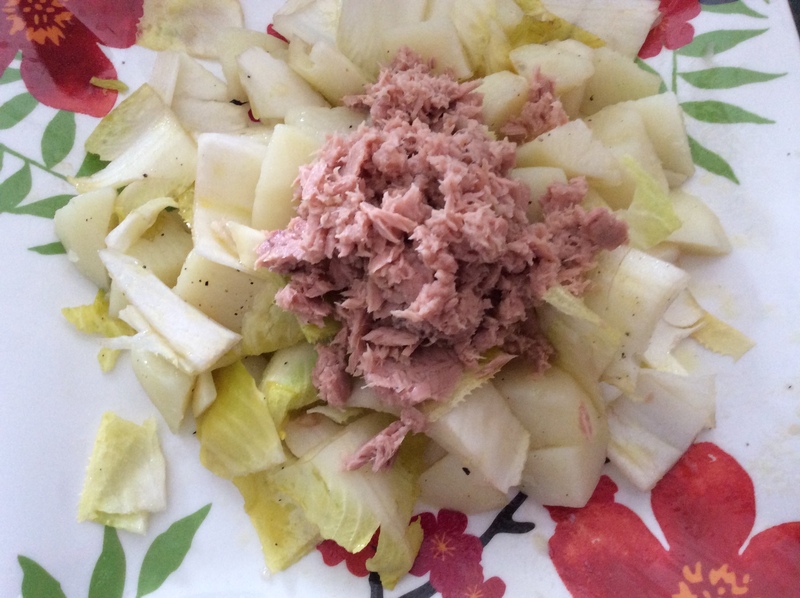 If you would like to have a balanced meal, add a can of tuna in water (remember to dry it very well before to add it to your salad), and when your potatoes are still warm, enjoy your meal!!! I really hope you’ll appreciate this salad as I do.. and if your answer is positive, please leave a comment!! !